So … let me recap. Last year, after the Times Union and I parted ways, they started soliciting me to get a subscription to their newspaper. You know, the “two questions on a meaningless survey and you get thirteen free Sunday issues with a hidden caveat to have your name secretly signed up for a long-time subscription, whether you want it or not” plan. I told them I wasn’t interested, and that I would not like to be called any more. I told them again I was not interested, and that I would not like to be called any more. I told them I was not interested, and to please stop calling me. That’s not a threat, guys. That’s a promise. Because, yesterday … right in the middle of my day job … I got a call. 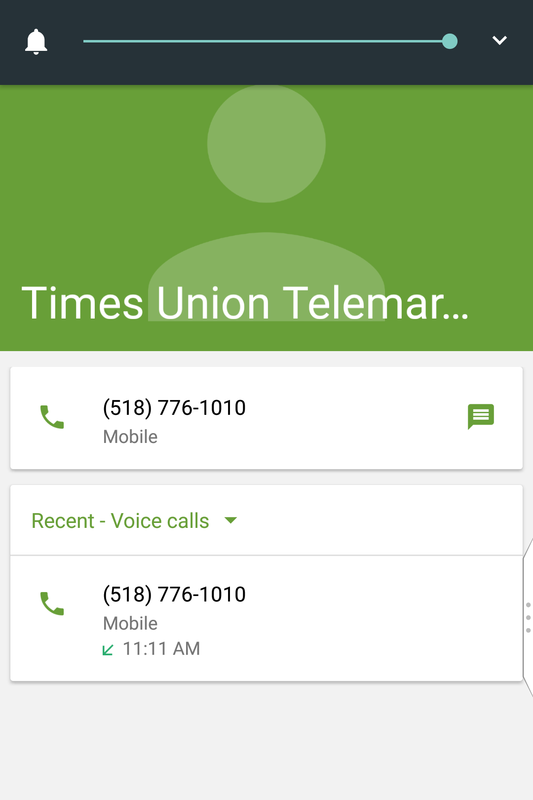 And yes, it was from the (518) 776-1010 telephone number designated as the Albany Times Union subscription solicitation line. See? Screen capture to my right. Now did I not previously warn the Times Union to refrain from contacting me about signing up for a newspaper subscription? Is the recording function working on this BlackBerry KEYone? All right, telephone solicitor… it’s all on you. So let’s see what we can glean from this. The guy told me near the end of the sales pitch that he received my name from the Times Union itself, apparently as part of the newspaper’s solicitation database. My name and address apparently popped up on his server with instructions to call me. And, of course, completely ignoring the Do Not Call Registry and completely ignoring requests to not call me any more. I guess I finally see what the TU thinks of me after all these years. So time travel really DOES work, doesn’t it NBC? Sure, they deliver something of value, whether it be news content or — back in the day — an audience for your blog, but that’s absolutely true: you are a source of revenue. Nothing more, nothing less.